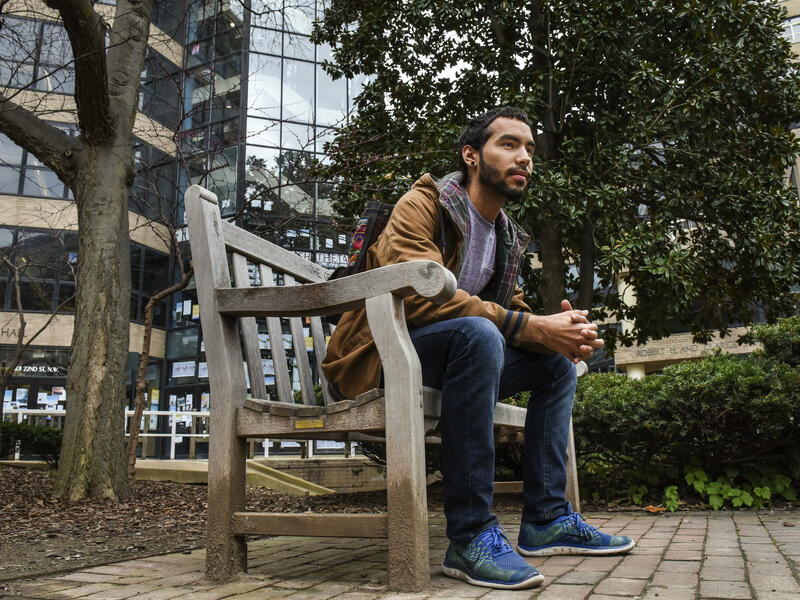 Caleb Torres, a senior at George Washington University, says he ran out of grocery money his freshmen year, so he began skipping meals. On Tuesday, the HOPE lab released a new report based on an online survey of more than 40,000 students at 66 community colleges and universities. Among the findings: In the past 30 days, 36 percent of university students and 42 percent of community college students felt food insecure, which "means that students have trouble getting enough to eat on a daily basis," Goldrick-Rab says. "They may go without meals, they may lose weight and they may go without nutritious food." She spoke with All Things Considered host Audie Cornish about the report, and the challenges ahead. Excerpts of their conversation are transcribed below, edited for length and clarity. Because people volunteered to participate in this survey, it's a self-selecting group. Does it really represent what's going on in higher education right now? There are no nationally representative studies available to look at these problems. The federal government is the only one who collects that sort of information on college students, and they don't ask a single question about food or housing insecurity. So the only way we can get information about this is by asking colleges' permission to survey their students. This is an area of research that receives almost no funding. In our survey, we used the U.S. Department of Agriculture's standardized measure of food security with everybody all over the world. We asked college students the exact same set of questions. We asked them about things that have happened to them in the past 30 days, and the extent to which they agree with statements like: I have not had enough food to eat because of lack of money. I have lost weight because I have not eaten enough. I have skipped meals. What's the effect on low-income students? It really undermines their ability to do well in school. They try incredibly hard, when we look at how much time they spend in the classroom and studying. It's the same as for students who don't have these problems, but their grades suffer, their test scores appear to be lower, and overall their chances of graduating are slimmer. They can barely escape the conditions of poverty long enough to complete their degrees. Would this matter if they were in school or not? Part of what we're seeing here is people who appear to be pushed downward, who are struggling more, because they're also grappling with the high price of higher education. And some of them — including people who, frankly, look middle class — are now struggling with food or housing insecurity because their resources pale in comparison to those high college prices. So they really wouldn't be going through these issues if they weren't in college. Many of the schools in the study are community colleges, and they are tasked with one thing: to educate. Are you saying that they need to do more, and why should they? I'm not suggesting that colleges become social service agencies, but rather, in support of their main focus — which is to help students graduate — they may need to undertake partnerships and develop resources in conjunction with social service agencies. For example, in K-12 education we don't merely provide free public education. We also have a national school lunch program. We also work with housing authorities to provide subsidized housing to students. We also provide subsidized transportation, so that students can actually get to school. Most of those sorts of things are currently missing in higher education, and they're going to need to be brought to the table if we want people to graduate. Aren't they missing because these are ostensibly adults that we're talking about? At a certain point, are we saying, "You need to provide for yourself"? I think that's mostly right except for one thing. These days, college has become the new high school. It's very difficult to get into the workforce without first getting a degree. So I don't think it's a question of whether we're supporting a child or an adult, but rather whether we're supporting a hardworking, talented person who is trying to become economically sufficient. We really don't know if the problem is getting worse because no one is systematically collecting data on the same sorts of people at the same colleges over time. There is no good trend data. But the conditions that are leading to these problems do appear to be hard, and harder perhaps than they've been in the prior decades. For example, families clearly don't have enough money to live on these days. The social safety net is not nearly as supportive as it used to be. And work is extremely hard to find, particularly good-paying work for part-time workers. All Things Considered Producer Alyssa Edes contributed to this report. In college, it's hard to learn while you're hungry. That's a message Temple University education professor Sara Goldrick-Rab has been hitting for her whole career. She self identifies as a scholar activist. She's advocated for free college. And in 2013, she founded the Wisconsin HOPE Lab to help turn research about low-income students into supportive policies. Today, the HOPE Lab has come out with a new report based on an online survey of more than 40,000 students at 66 community colleges and universities. The main finding is that 1/3 of university students face food and housing insecurity. Sara Goldrick-Rab, welcome to the program. SARA GOLDRICK-RAB: Thanks for having me. CORNISH: So we understand the definition of this - when you say food insecurity, what does that mean? When you say housing insecurity, what does that mean? What kind of survey question would yield an answer that would give you a window into that? GOLDRICK-RAB: So we asked them questions about the things that have happened to them in the last 30 days. We asked them the extent to which they agree with a statement like, I have not had enough food to eat because of lack of money; I have lost weight because I've not eaten enough; I have skipped meals because I have not eaten enough. For housing and security, we asked them about things like, I have not paid my rent; I have not paid my utilities; I have not had a place to sleep at night. CORNISH: And from that, what's the picture that the survey painted this year? GOLDRICK-RAB: So what we learned is - for the university students - 36 percent were food insecure, 36 percent of them were also housing insecure and 9 percent of them were homeless. We've surveyed the community college students multiple times. And we found 56 percent for food insecurity, 51 percent for housing insecurity and 13 percent for homelessness. CORNISH: What's the effect on this student population then? You've done a lot of work on low-income students. GOLDRICK-RAB: It really undermines their ability to do well in school. When we look at how much time they spend in the classroom and how much time they spend studying, it's the same as for students who don't have these problems. But their grades suffer. And overall, their chances of graduating are slimmer. CORNISH: This survey is volunteer, right? It's an online survey. Does it really represent what's going on in higher education right now? GOLDRICK-RAB: Well, I don't think that it's nationally representative to be sure. These are volunteer colleges who've allowed us in to ask their students questions. And certainly, the students who answered the questions have decided they want to. But they had no idea this was about food or housing insecurity. CORNISH: A lot of the schools that were in the study were community colleges, right? And they are tasked with one thing - to educate. Are you saying that they need to do much more, and why should they? GOLDRICK-RAB: I'm not suggesting that colleges become social service agencies. But rather in support of their main focus, which is to help students graduate, they may need to undertake partnerships with social service agencies. For example, in K-12 education, we also have a national school lunch program. We also work with housing authorities and providers to provide subsidized housing to students. We also provide subsidized transportation so that students can actually get to school. Most of those sorts of things are currently missing in higher education, and they're going to need to be brought to the table if we want people to graduate. CORNISH: Aren't they missing because these are ostensibly adults that we're talking about, right? At a certain point, we're saying you need to provide for yourself. GOLDRICK-RAB: I think that's mostly right except for one thing. College has become the new high school. It's very difficult to get into the workforce without first getting at least a community college or technical degree. And it's not really about being an adult yet. It's about having a real shot at economic self-sufficiency. It is a very big return on an investment to support someone to become economically self-sufficient through an education - whether it is providing food or housing - so that then they're on their own two feet, and they won't need those supports going forward. CORNISH: Dr. Sara Goldrick-Rab is a professor of higher education policy and sociology at Temple University. Thank you so much for speaking with us. GOLDRICK-RAB: Thanks for having me. Transcript provided by NPR, Copyright NPR.